Discussion in 'Lizardmen & Saurian Ancients Discussion' started by LeanderAT, Sep 19, 2017. I've only played one Warhammer game with Dwarves (Battle for Skull Pass army) years ago. Now I want to play with my Lizardmen. 1) Is it true that there is no fixed number how many units you need (core, rare ones, heroes) etc. in WHFB 8th edition but a percentage? 25%+ core, up to 50% elite etc.? How can I play my Slann AND Groq-Gar? Is it only possible in huge battles? 2) If I use the Slann, I could use the Groq-Gar model (Grymlok in this case) as a mount for any other hero right? I have no clue how heroes are placed...do they run around and fight on their own? Are the part of a unit? 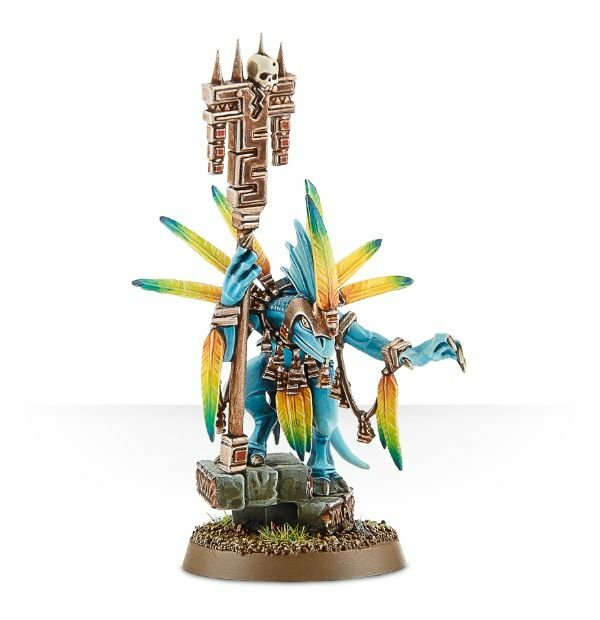 For example, is a Skink Priest a single model all alone or can I put him on a Stegadon? On Grymlok? In a Saurus Warriors unit? In a cavalry unit? Who is my Slann? Can I play him as a normal Slann AND also as Mazdamundi? Lord Kroak? 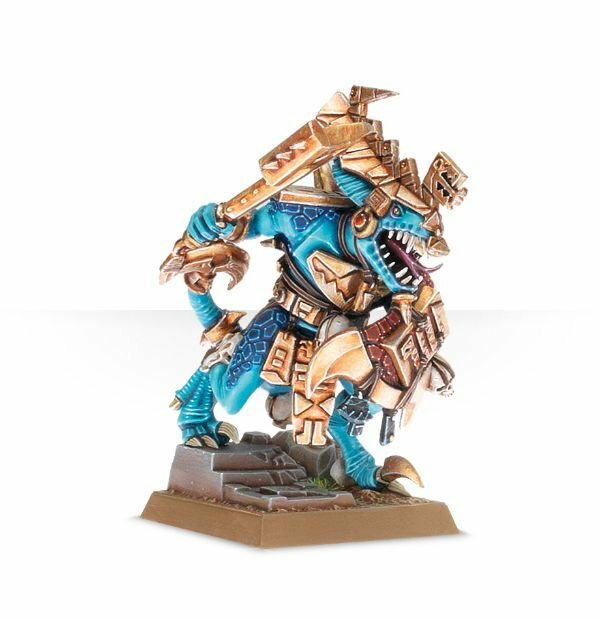 I know Kroak as a unique mini but what about Madzamundi? 3) How can I use my units wisely? c) Old Blood (https://www.games-workshop.com/resources/catalog/product/600x620/99070208001_SaurusOldbloodNEW01.jpg) ... his base is bigger than a Saurus base so how can I use him but all alone? 1) Is it true that there is no fixed number how many units you need (core, rare ones, heroes) etc. in WHFB 8th edition but a percentage? 25%+ core, up to 50% elite etc.? YEP IT'S A PERCENTAGE. IT'S GENERALY A GOOD IDEA TO ONLY JOIN UNITS THAT ARE THE SAME SPEED AND BASE SIZE. THE REGULAR SLAN AND LORD KROAK HAVE MODELS. MAZUMUNDI DOES NOT. DON'T GET THEM ALL KILLED. BE AGRESSIVE AND HAVE THEM CHARGE THE FLANKS OF YOUR ENEMIES. POSSIBLY IN COMBINATION WITH A FRONTAL COLD ONE CALVERY CHARGE. HIS BASE WAS THE SAME SIZE BACK IN 8TH EDITION. USE HIM IN A UNIT OR ON HIS OWN, ALSO HE CAN LEAVE A UNIT IF HE WANTS. KEEP HIM SAFE, HE IS QUITE SQUISHY, BUT ALS KEEP HIM CLOSE ENOUGH TO BE USEFULL. ANOTHER FLANKING UNIT, BUT SOMETIMES GOOD FOR A FRONTAL CHARGE IF THEY HAVE HELP. OR THE OPONENT UNIT IS WEAK. THEY ARE AVERAGE SPEED FOR INFANTRY... THAT IS TO SAY, SLOW. THEY ARE QUITE GOOD FOR A CORE UNIT AND WILL OFTEN FIGHT TO THE LAST MODEL. BUT THEIR SHORT RANGE IS A PROBLEM, KEEP THEM IN TERAIN IF POSSIBLE. ALSO POISION IS GENERALY OUR ANSWER TO ENEMY MONSTER UITS. FAST TOUGH AND DURRABLE... BUT ALSO EXPENSIVE. MOST CALVERY WIN BY CHARGEING, OURS WINS BY ENDURANCE. ALSO A GREAT DELEVERY SYSTEM FOR OUR SAURUS HEROS ON COLDONES. Oh I got a Hardy seal of approval. I wasn't clear enough how I mean "How can I use my units wisely?". I wanted to ask how I can mix my units with heroes. I did not mean general tactics for units but in what units a hero/priest etc. can be put...like "Can you put an Old Blood on a Stegadon? On a Carnosaur?" etc. What, if I have a unit with champion, standard bearer and musician...can I add a hero there? Does it replace the champion? I think it's better to read the rules before asking many dumb noob questions. All mount options are mentioned in the book. Saurus heros can ride Cold ones and Carnasaurs. regular Saurus can ride cold ones. skinks priest can ride engine of the gods equiped stagadons. skink chiefs can ride the other stegadons, and terradons.